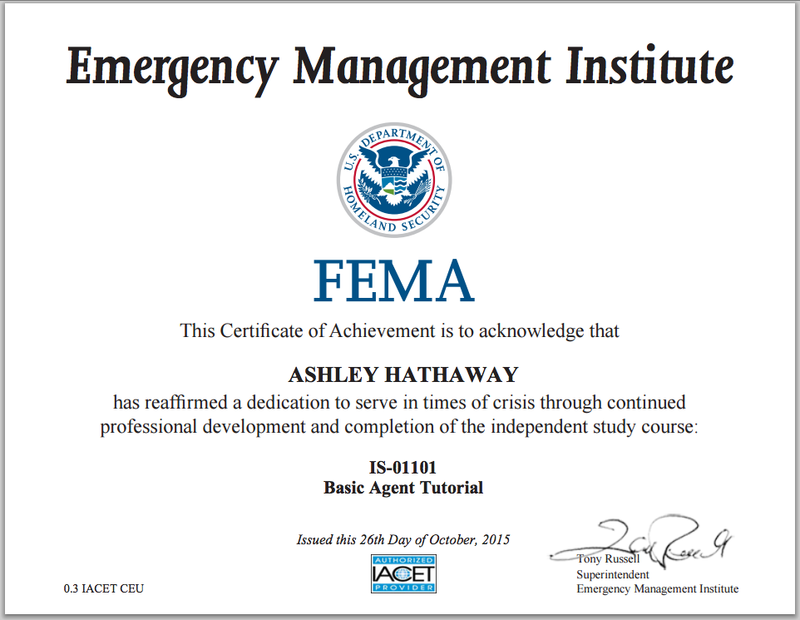 Congratulations to our Navigator, Ashley Hathaway, for completing FEMA Emergency Management Institute’s IS-01101 “Basic Agent Tutorial” independent study course! When it comes to homeowners insurance we do more than just compare the options across 29 independent and exclusive insurance carriers. We’re also out to educate consumers about how property and casualty insurance works. We want to empower our customers to make smart decisions about these complex financial products. That’s why our Navigators receive regular training and certifications above and beyond state and federal licensing requirements. Our Navigators are certified by FEMA’s Emergency Management Institute to serve in times of crisis. For example, this certificate affirms that our Navigator has just completed the first independent study course in a continuing education program with the Federal Emergency Management Administration’s Emergency Management Institute. From here, Navigators go on to pursue certifications for other emergency management topics like flood risk and recovery. We don’t just provide continuing education courses. We take them ourselves! Homeowners insurance and other types of property and casualty insurance are complex financial products. By educating ourselves and our customers, we’re collectively reducing risks and contributing to a stronger economy. We’re no longer surprised by what our customers learn about their homeowners insurance when they get a comparison from us. But we never get tired of hearing how appreciative customers are when we improve their coverage and lower their premiums. Helping our customers in this way motivates our Navigators to learn more themselves. Do you want to learn how COMPARITY works? Let our Navigators help you compare your homeowners and auto insurance options so you can be sure you have the right coverage for the best price. Our service is free, convenient, and we protect your privacy throughout the process. Start a secure application online now at https://comparityins.com. ← Homeowners Insurance…Compared to What?